TOO CLOSE TO CALL – Team Meger’s Bayly Scoffin and Team Horte’s Sian Molloy measure for shot rock after the fifth end in Saturday’s junior women’s playdowns. Horte’s yellow rock was slightly closer, giving her team a 6-2 lead. SHOWTIME – After eight years of watching star junior skip Sarah Koltun win the Yukon junior women’s title, Bailey Horte is finally getting her shot. After spending the last eight years in Sarah Koltun’s shadow, Bailey Horte is finally in the spotlight. The 18-year-old skip led her rink to a long-awaited Yukon junior women’s title Saturday, earning a trip to nationals in the process. Horte’s rink defeated a younger team led by Alyssa Meger, 14, by scores of 9-3 and 13-4 to sweep the junior championship series Saturday at the Whitehorse Curling Club. Sarah Koltun, who skipped the youngest team in Scotties Tournament of Hearts history last season, is no longer age-eligible for junior play. 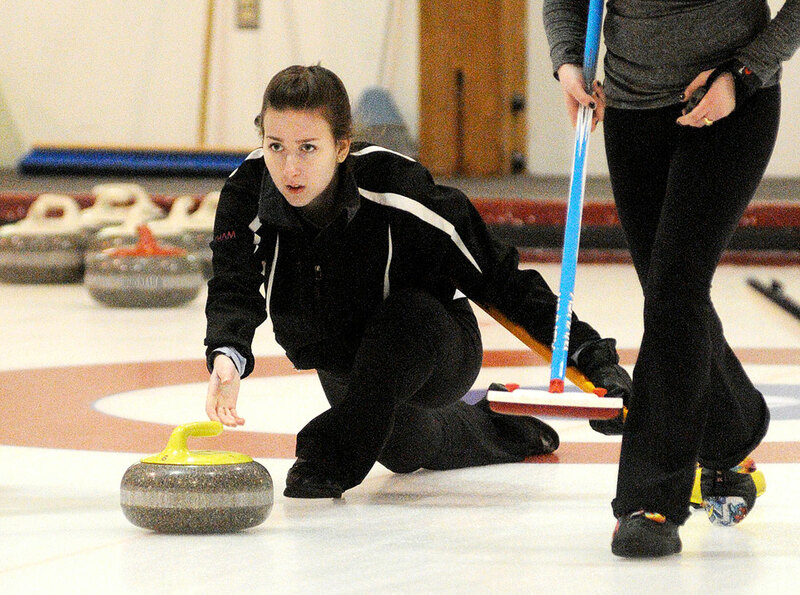 Horte, joined by third Kelsey Meger, second Kelly Mahoney and lead Sian Molloy, will go on to represent the Yukon at the 2015 M&M Meat Shops Canadian Junior Curling Championships in Cornerbrook, Nfld., Jan. 24 to Feb. 1. The nationals berth has been a long time coming, a smiling Horte said. The morning game saw Horte take control early with a double in the first end, before stealing points for five straight ends, entering the seventh with a 8-0 lead. Meger came up with a huge triple in the seventh end, but Horte followed up with a single for a 9-3 win. Saturday afternoon’s contest saw Meger get out to a 1-0 lead, but Horte responded with three points in the second and two more in the third. She wouldn’t trail again. Holding a 7-4 lead heading into the ninth end, Horte scored four with a well-executed takeout for an 11-4 lead. She finished the game with a double for a 13-4 win. “Our team definitely has a lot more experience,” Horte said of the lopsided scorelines. “I know a couple of their girls started curling competitively just this year. Despite the consecutive losses, Alyssa Meger said the experience will help when her rink heads to the Canada Winter Games in Prince George, B.C., in March. Her rink, which also includes third Bayly Scoffin, second Peyton L’Henaff and lead Karen Smallwood, was recently acclaimed as the Yukon’s junior women representatives for the event. “We got some really good competitive practice,” said Meger, the younger sister of Horte’s third, Kelsey. 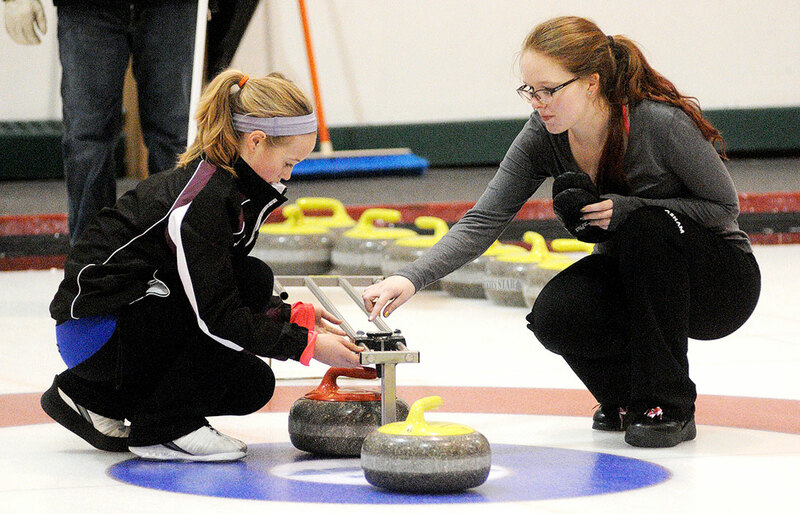 An ironic twist courtesy of small-town curling saw Rhonda Horte and Wade Scoffin coaching against their daughters. Scoffin said experience played a heavy role in Team Horte’s dominating Yukon playdowns. “With junior curling, teams always learn exponentially,” Scoffin said. “So with Sarah Koltun’s team graduating out of juniors, these younger ladies have been learning from their experiences. Meanwhile, Joe Wallingham’s junior men’s rink was acclaimed to nationals this season, with no teams prepared to battle him for the opportunity. The 18-year-old will head to Newfoundland with the same team he had at last year’s national tournament. Wallingham is once again joined by third Brayden Klassen, second Trygg Jensen and lead Spencer Wallace. This season’s Canadian championship marks the third time the young skip has represented the Yukon at junior nationals. Wallingham and company finished with a 5-4 record last year in Liverpool, N.S. – good for ninth overall. Following nationals, Klassen will lead the Yukon junior men’s rink into action at the Canada Winter Games in Prince George. Joining him will be Bailey Muir-Cressman, Jensen and younger brother Will Klassen. In other junior news, Yukoner Thomas Scoffin is also hoping to return to nationals for the eighth time, after missing out on last year’s event with a loss in the provincial finals in Alberta. Scoffin’s University of Alberta Junior Golden Bears rink is currently ranked as the top team in the Alberta North region, with playdowns looming early next month. This year will be the 20-year-old Whitehorse native’s last crack at the country’s top junior tournament. Scoffin is currently home for the holidays.